Nest Style Granada v Granada, Španělsko: Zarezervujte nyní! If the total or partial cancellation is made 21 days before the date of arrival 30% of the total reservation will be charged. If the total or partial cancellation is effected between 21 and 10 days before arrival, 50% of the reservation will be charged. If the total or partial cancellation is effected between 10 days and the day of the check-in date. The total amount of the reservation will be charged. On arrival of the group, a deposit of 30% of the ful amount of the billing by way of damages caused during the stay must be left. Upon leaving, in the case of no damage, the deposit will be refunded in full. In the case of damage, there shall be an assessment of damages and any amounts will be recovered. This designer hotel is in the City Hall square of Granada, in the city centre. The building is on the corner of Calle Navas, the best Street of the city, where you can eat tapas. 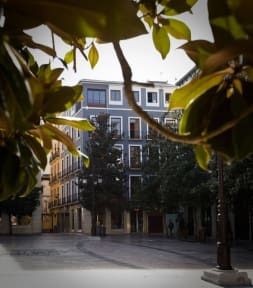 We are located only at 300 mt from the Cathedral, 100 mt from the shopping area, 50 mt from Puerta Real, 10 minutes walking from the precious Albaicin area and the bus stop to get to the Alhambra is only 5 minutes walking. The hotel offers a 24 hours reception service, tablets- rent service, free WIFI in the whole building, a luggage room service, tourist information and help to buy Alhambra tickets, breakfast service at the top floor with a beautiful views and a kitchen completely equipped for customer use. This common area has air conditioning hot/cold. 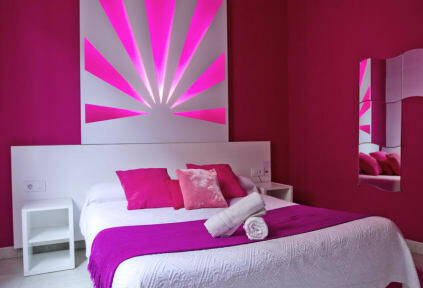 Our rooms are cool and modern, with cheerful tonalities, such as pink, orange and yellow. Each room has his own private bathroom, with shower, air conditioning system and phone. Anyone above 35 years of age will be required to book private rooms only.